The Sports Fan Playground is currently offering Black Friday and Cyber Monday sales on deals on various sporting goods from the top leagues around the world including the NFL, NBA, FIFA, UFC, WWE, NHL and recreational sports. 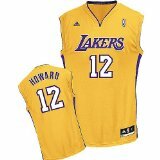 Dwight Howard LA Lakers Apparel Available at the Sports Fan Playground. The Sports Fan Playground is currently beginning its Black Friday & Cyber Monday deals now, ahead of the actual official days, which are over Thanksgiving weekend. The Playground has top apparel available from the NFL, NBA, NHL, MLB, FIFA, UFC, NCAA and more - at among the lowest prices online. Apparel items include jerseys, hats, t-shirts, sweatshirts, hoodies, shoes and more. The store also carries a variety of sporting goods from many sports including basketball, football, baseball, golf, soccer and more. The sporting goods are available for young kids who are becoming interested in sports, all the way up to adults just looking to stay in shape in recreation leagues. Many of the items - including accessories and the actual gear for many of the sports, are currently marked down up to 40%. An area where the Sports Fan Playground is looking to be strong in the marketplace is bowling. The store currently has a variety of bowling balls, pins, shoes, bags and other various essentials that bowlers need to have the best games possible. The Sports Fan Playground also has an extensive amount of sports memorabilia and sports collectibles. Currently, the store has autographed items from star athletes such as Michael Jordan, Robert Griffin III, Larry Bird, Brian Urlacher, Kobe Bryant and many more. Items available include balls, bats, shoes, pictures, helmets, cards, ticket stubs, and jerseys - among many others. At The Sports Fan Playground, the store is currently beginning to roll out Black Friday and Cyber Monday deals on various electronic items in the store, including TVs, video games, IT systems, appliances, and phones. As for phones, SportsFanPlayground.com has mark downs of up to 30% on select Apple iPhones. The models are available in the 3G, 4, 4S and the newest improvement of the iPhone - the iPhone 5. For the people that are fans of Samsung, SportsFanPlayground.com has deals on the new Samsung Galaxy S III, with deals of up to 42% off of the retail price. For more information, visit SportsFanPlayground.com. SportsFanPlayground.com is a leading online e-commerce provider of electronics which range from tablets, PCs and cameras to video games, DVDs, Blu-Ray Discs, appliances, lawn and garden products, IT systems and hardware, and more. The store recently began having the unlocked Apple iPhones 5 available in their marketplace. The store also carries the top brands in electronics including Xbox 360, Playstation 3, Cisco, Apple, Sony, Samsung, Microsoft, EA Sports, and many more. The company recently began its initial expansion into clothing and jewelry and will continue to expand over the next several months. The store is a leading provider of NFL, NBA, MLB, NCAA, UFC and FIFA apparel and accessories. The playground has various shoes, jackets, home & garden products, bedroom and kitchen products - all with sports and team themes and help for tailgating or throwing a party for the big game happening soon.